Disclaimer: I am reasonably certain about most of the identifications, especially those verified by James Trager & Alex Wild. For some of the names I used cf. (compare with) because of the difficulty in separating very similar species. 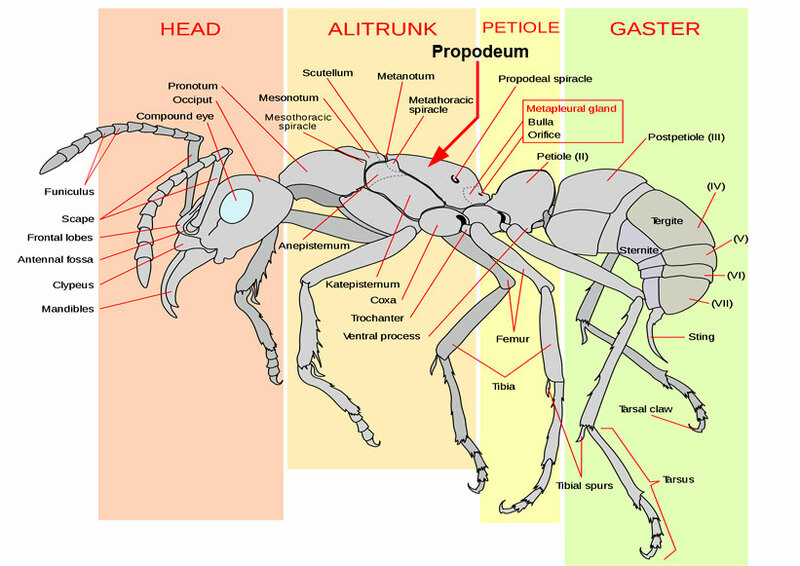 On others I simply placed the ants in their respective subgroups of closely-related species. Large, difficult genera often require a specialist for precise species verification. Although identifications from my photo images may be impossible without voucher specimens to examine, comments and/or suggestions about my identifications are welcome. 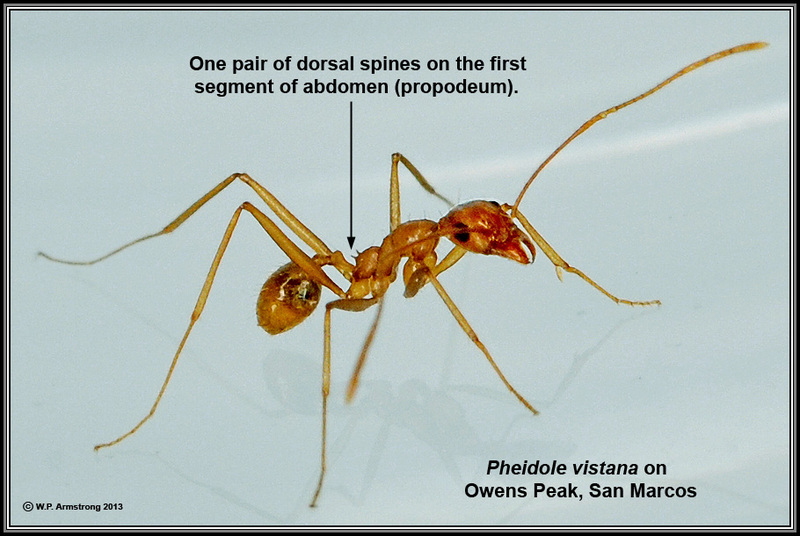 Pheidole is the largest genus of ants with a worldwide distribution, especially the tropics. There is marked difference in the worker caste sizes (majors and minors). Major workers have an unusually large head in proportion to their body. 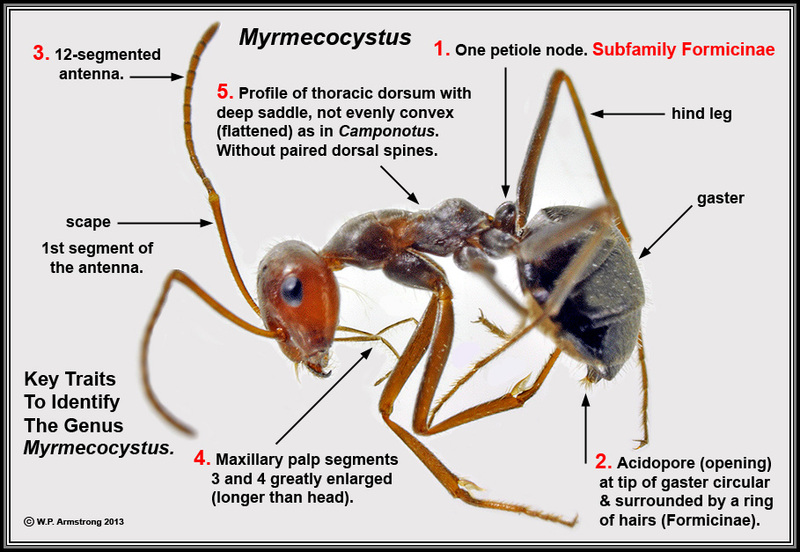 This is one of the ant genera that attracted me as a small child, and undoubtedly is one of the factors that sparked my interest that led to a career in biology! 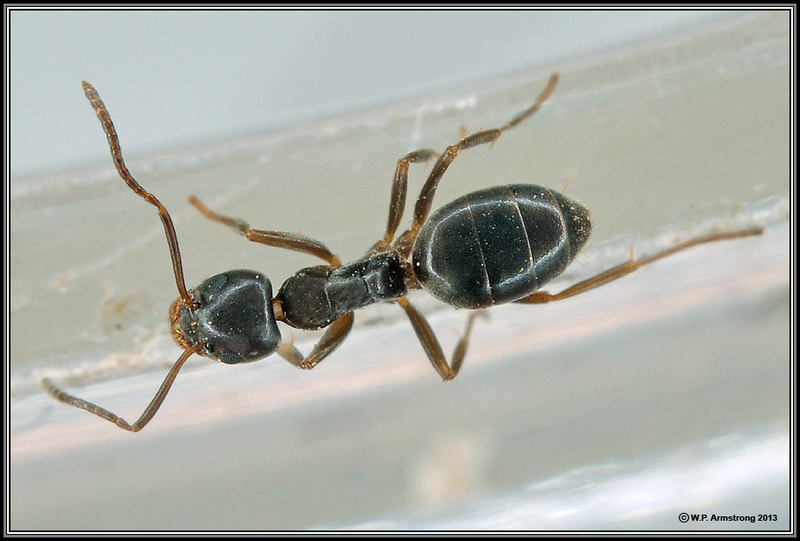 The above species of Pheidole is native to Arizona. The major has a strikingly massive head compared with its body. This is actually a supermajor (supersoldier) that is larger than regular majors. This species has 3 castes: minors, majors and supermajors. Most of the 1000+ species of Pheidole have only 2 castes, but apparently have the genetic potential (ancestral DNA) to produce supersoldiers. Biology professor Ehab Abouheif at McGill University in Montreal discovered that dabbing larvae with methoprene, a chemical that mimics juvenile hormone, will induce the development of supersoldiers. 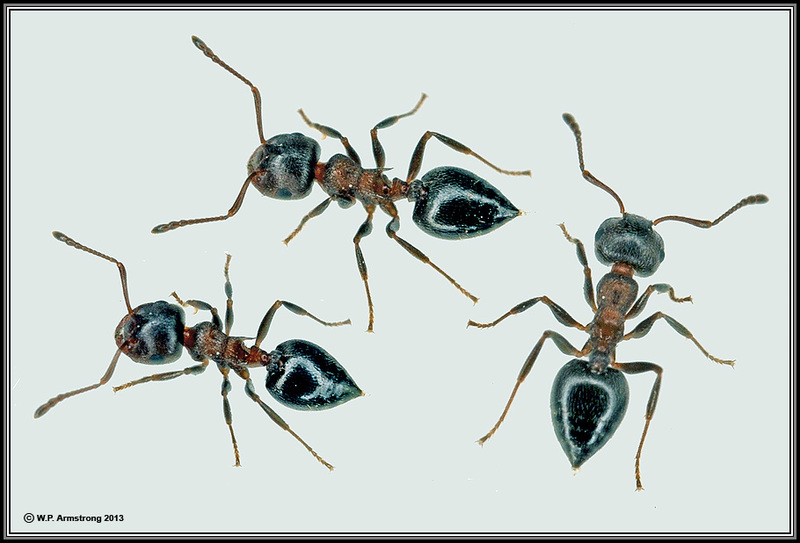 These large biting ants are presumably better able to defend the colony against invasions of aggressive army ants. The unknown species I observed during my formative years was in my home town of Arcadia, California. It apparently had regular majors, but their heads were distinctly larger than the minors. The colonies were at the edge of a Bermuda grass lawn, and the major and minor workers became agitated with the slightest disturbance. Unfortunately, most of the ant species I observed as a child in suburban areas have been replaced by the ubiquitous Argentine ant supercolony in southern California. 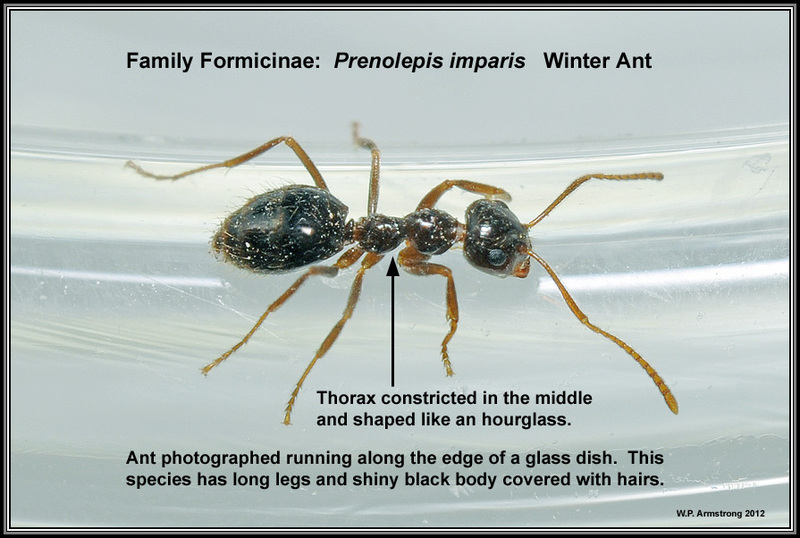 Note: I originally thought this was a species of Aphaenogaster because of the slender body with long legs and pair of dorsal spines on the propodeum. 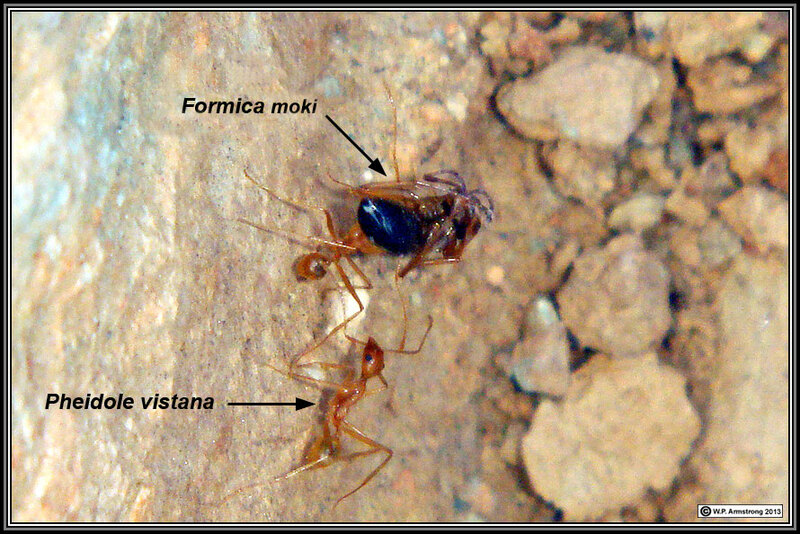 According to Alex Wild (personal communicatiion, October 2013) it is Pheidole vistana. The form of the mesosoma and the collar around the base of the head are diagnostic for this species. 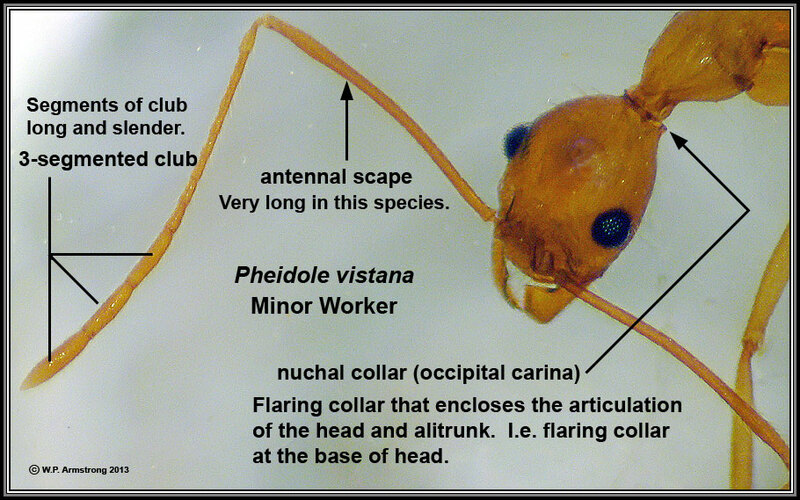 Pheidole has a 3-segmented antennal club, although it is slender in P. vistana. 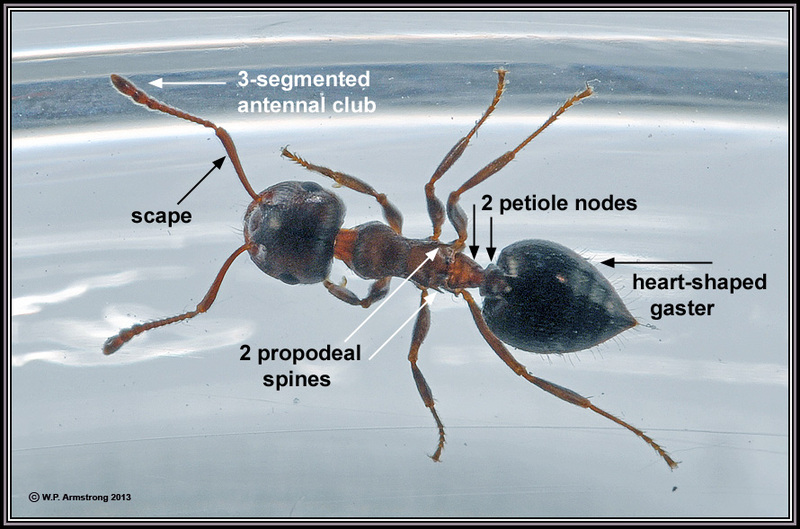 Aphaenogaster does not have an antennal club. Both genera belong to the tribe Pheidolini. They have been called "ghost ants" because in dim light the long, thin legs of foraging minors are not seen, and the bodies appear to be floating above the surface. I have seen pieces of Nature Valley granola moving this way across the surface of boulders on Owens Peak. Close-up view of a major worker. Pheidole vistana worker carrying dead field ant (Formica aerata) into its nest entrance. The debris near nest entrance was littered with insect body parts, mostly the heads and gasters of Formica aerata, a common ant on Owens Peak (see next image). The worst enemy of ants is other ants! 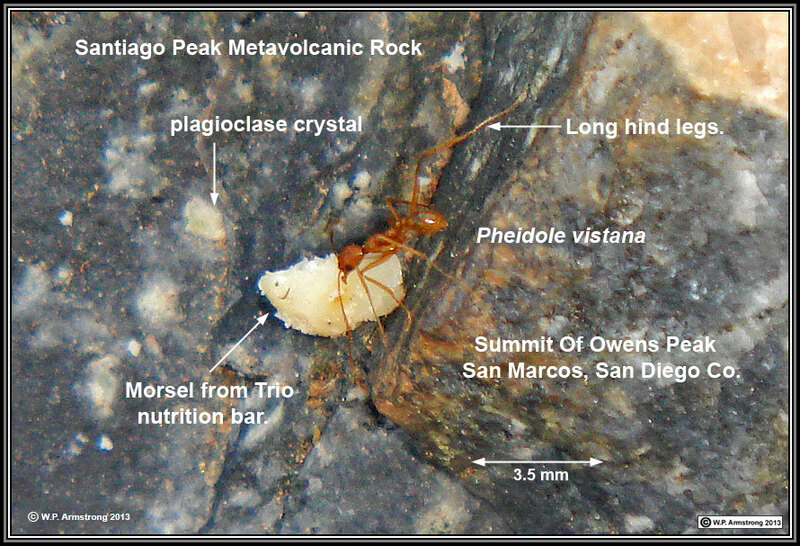 Above image shows a sample of ant body parts collected near a Pheidole vistana nest on Owens Peak. There was apparently a battle with nearby field ants (Formica moki). Some Pheidole lost their heads, but based on the ratio of body parts, presumably the Pheidole colony was victorious. Undoubtedly, the big-headed major workers (soldiers) played a valuable role in this victory! 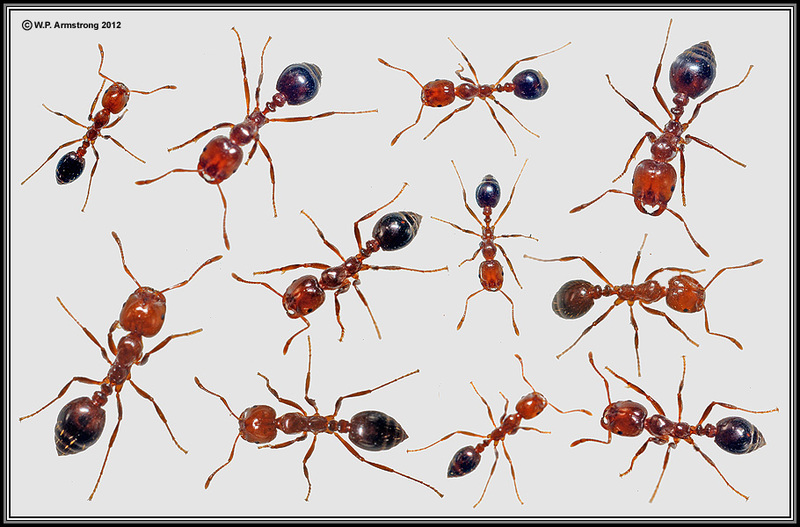 Note: Many of these native ant species have been completely eliminated from urbanized areas of southern California by the Argentine ant (Linepithema humile). This is particularly true in areas that a regularly watered, providing damp, cool habitats for Linepithema. Even larger, more powerful harvester ants are no match for the sheer numbers of aggressive Argentine ants. 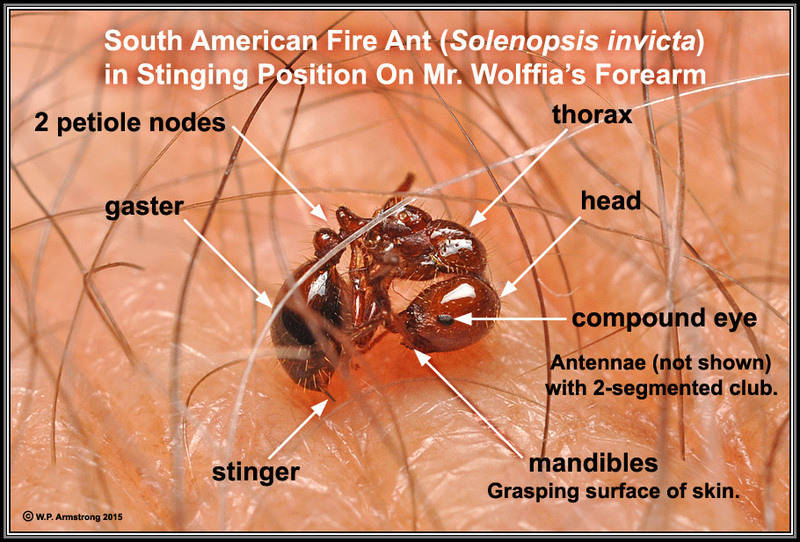 The imported fire ant (Solenopsis invicta) is another prolific invasive species from South America that might even outcompete the Argentine ant. 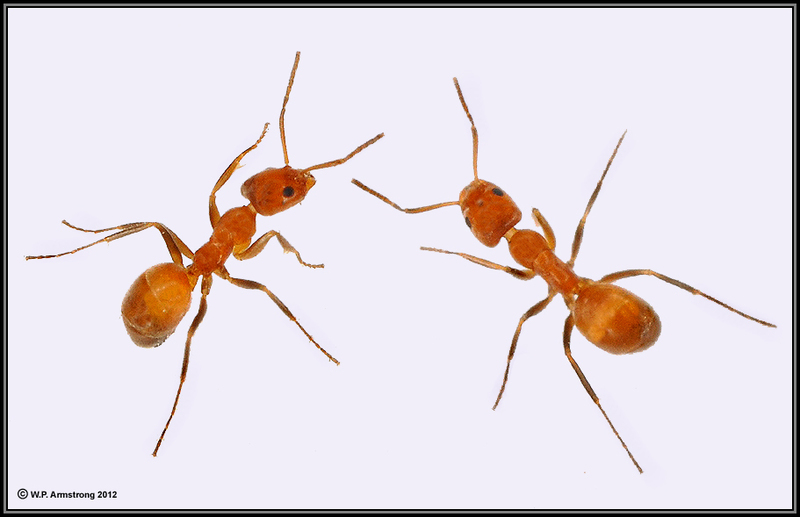 Southern fire ant (Solenopsis xyloni), native to arid regions of the southern and western United States, and close relative of the infamous imported fire ant (S. invicta) of the eastern U.S. The latter species is native to South America and is a serious insect pest in many tropical and temperate countries of the world. 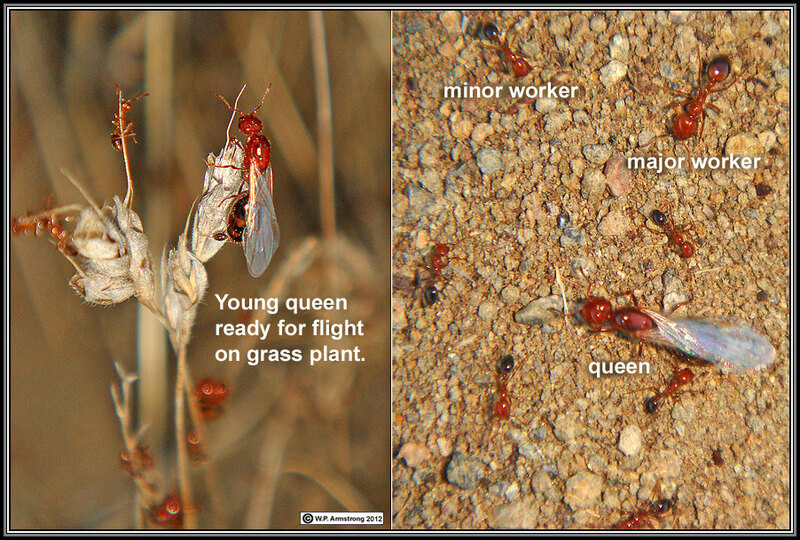 This is a polymorphic species with two sizes of workers called majors and minors. The minor workers are only about 3.0 mm long (slightly over 1/8 inch). Major workers are twice as large. Although they are small they have a potent sting, especially if they get you between the fingers. When disturbed the workers exhibit a phenomenon known as "gaster wagging" where they raise and vibrate their abdomen. 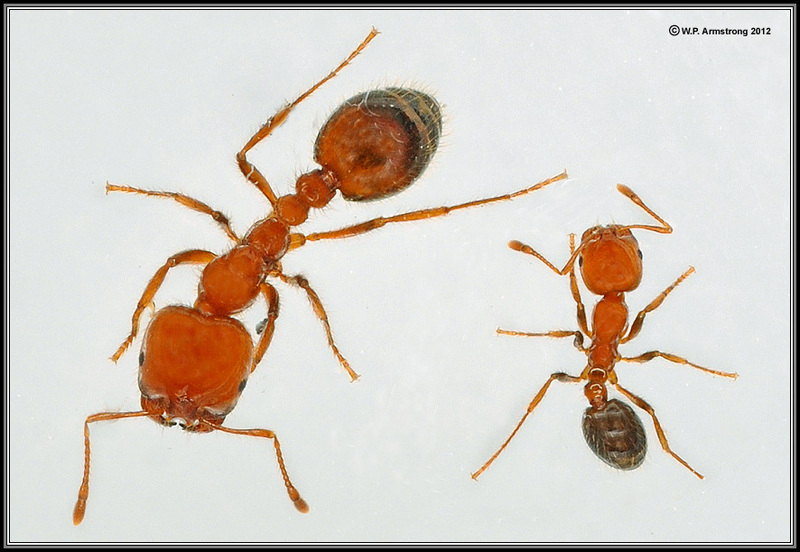 They are aggressive little ants, but have been annihilated in many urbanized areas of southern California by the Argentine ant (Linepithema humile). It will be interesting to see what happens when invasive Argentine ants clash with the equally invasive South American fire ant. According to "Controlling Fire Ants Takes a Group Effort" published in the July 2009 issue of Agricultural Research Magazine: "In a battle with the Argentine ant, Linepithema humile, the fire ant won 80 percent of the time." 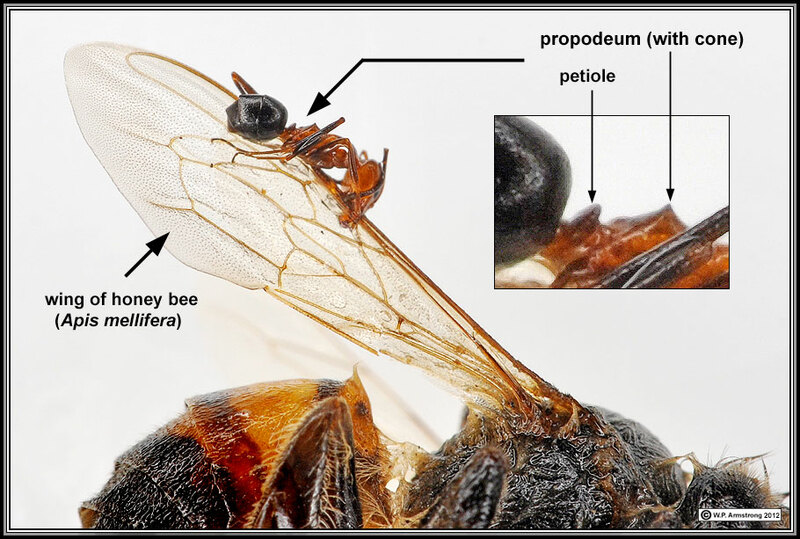 The venom in the sting is mostly piperidine alkaloids including isosolenopsin. These are single nitrogenous rings found in black pepper (Piper nigrum), wild tobaccos (Nicotiana) and poison hemlock (Conium maculatum). A clash between southern fire ants (Solenopsis xyloni) and orange desert ants (Forelius pruinosus) at the summit of Owens Peak (3 Aug 2013). The ants were attracted to my Nature Valley granola bar that I pulverized and placed on a metavolcanic boulder. 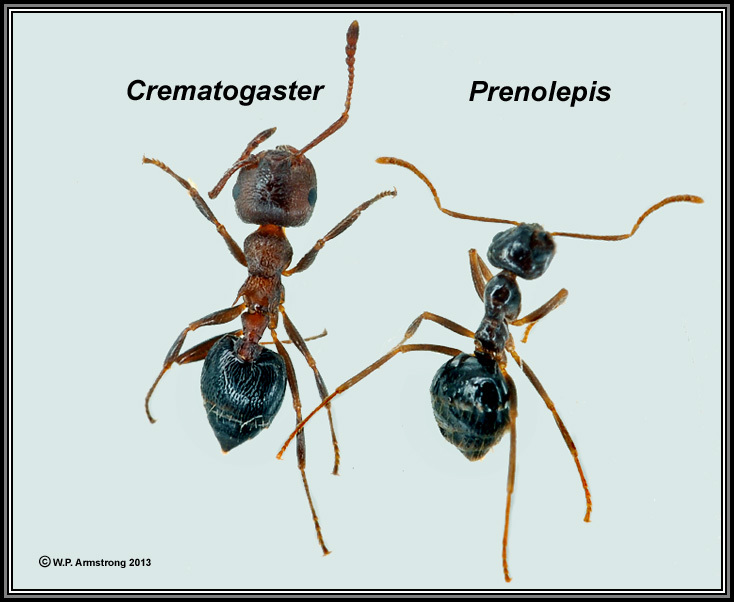 Some of the fire ants have their gasters raised and stingers exerted with drop of venom at tip. Vibrating (flagging) their gasters (gaster wagging) released venom into the air like an aerosol mist and repelled the orange fire ants (Forelius). 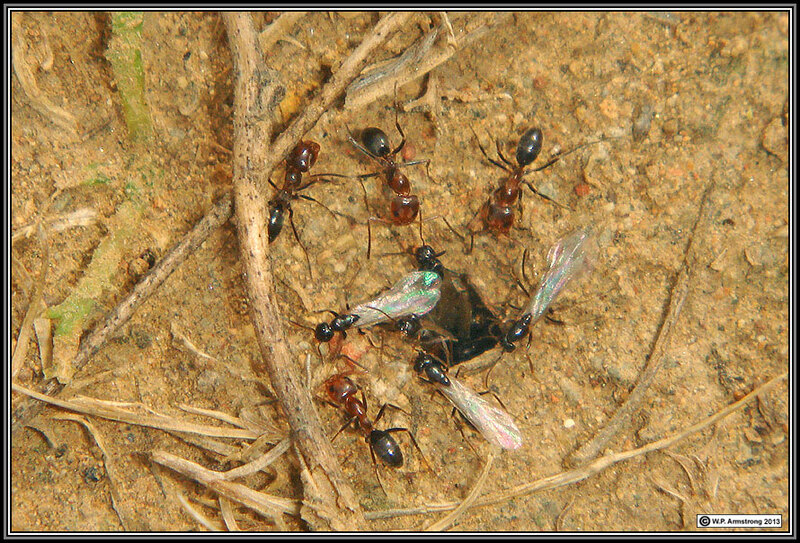 I watched the fire ants slowly force the Forelius ants away from the food source. The Forelius quickly backed away from the fire ants and retreated to another area of the boulder. See following video: Please wait about 6-7 seconds for video file to load, the wait is worth it! 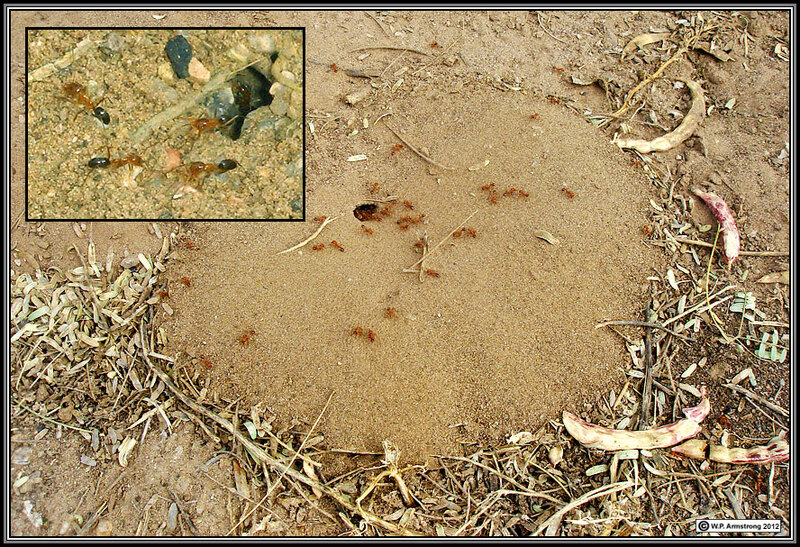 Note: On 6 August 2013 shortly after the above video was taken, the smaller, orange Forelius ants came in droves to the boulder and eventually overwhelmed the fire ants, forcing them to retreat into their crevice entrance. Apparently gaster wagging on this day just wasn't enough to repel the foraging Forelius. I did not observe any ants making physical contact or biting each other. The fire ants simply backed off by the sheer numbers of faster moving Forelius. Young southern fire ant queens (Solenopsis xyloni) preparing to take flight. Several days following rain on Owens Peak, the colonies began to swarm. The workers enlarged the entrance hole to nests and began to force the winged adults out. During their mating flight the young queens mate and eventually give rise to new colonies. Winged males (not shown) have black bodies. In the above image (left) the young winged queen climbed to the top of a nearby grass plant. The workers provide protection and will attack and sting anything near the queen, including this photographer. 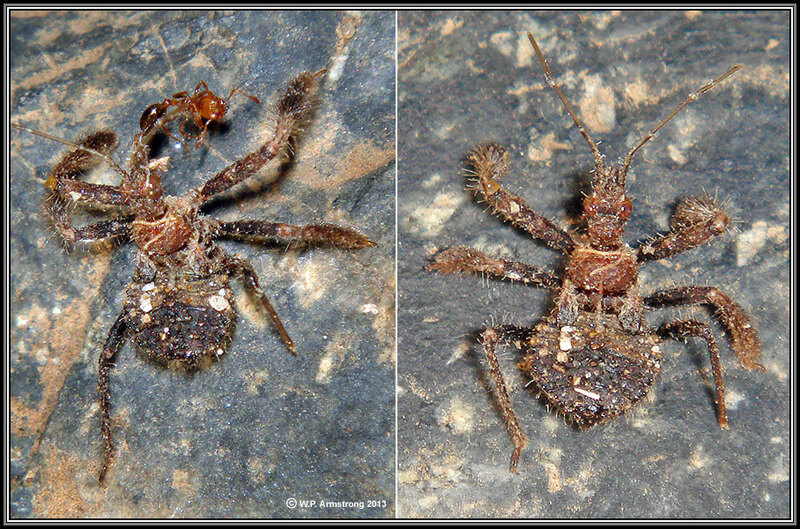 Southern fire ant major (Solenopsis xyloni) attacked by a juvenile (nymph) assassin bug (possibly the bee assassin: Apiomerus crassipes). The assassin bug is remarkably camouflaged and matches the Santiago Peak Metavolcanic Rock, including the white plagioclase crystals. The fire ant may have attacked first, an unwise decision considering the reputation of this fierce little bug. 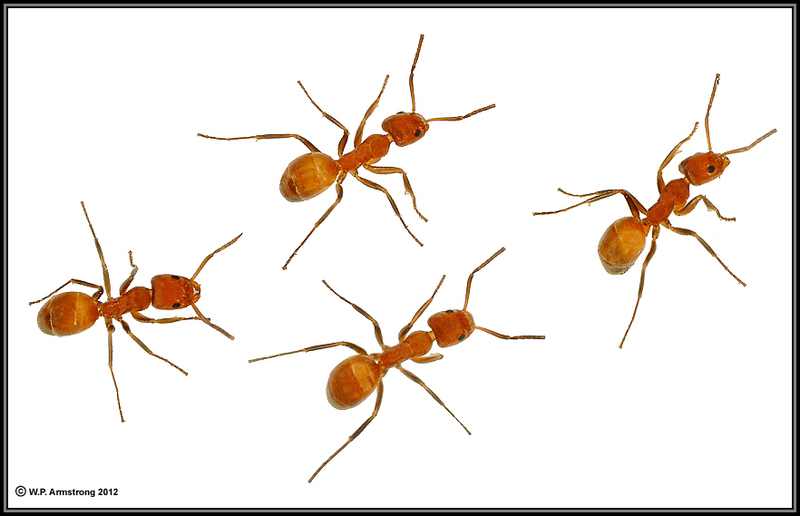 The South American fire ant (Solenopsis invicta) has been introduced into southern California. 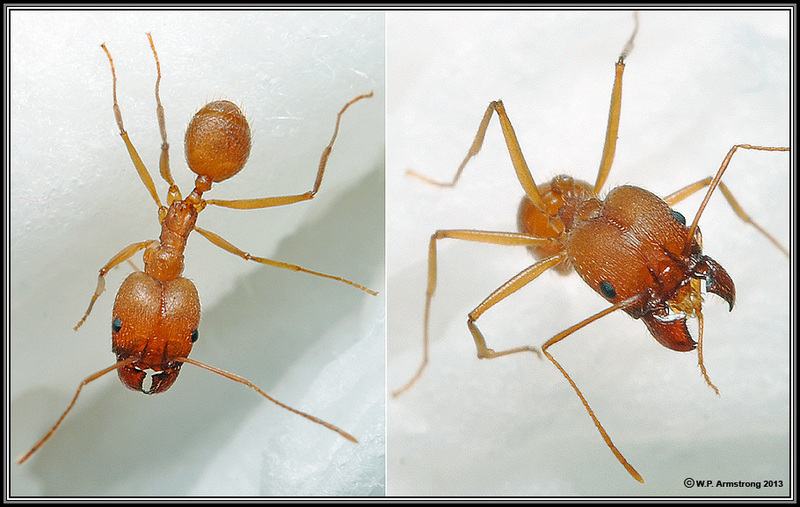 It is very similar in general appearance to our native southern fire ant (S. xyloni), except the head and thorax of the imported fire ant are a little darker. The dirt excavations are much larger and approach the size of gopher mounds! The sting of both species is about the same pain level, and leaves a raised reddish welt, especially in tender areas between the fingers. The excavated dirt mound of Solenopsis invicta resembles the loose diggings of a gopher mound in size. The mound in above photo is 5 inches in height. 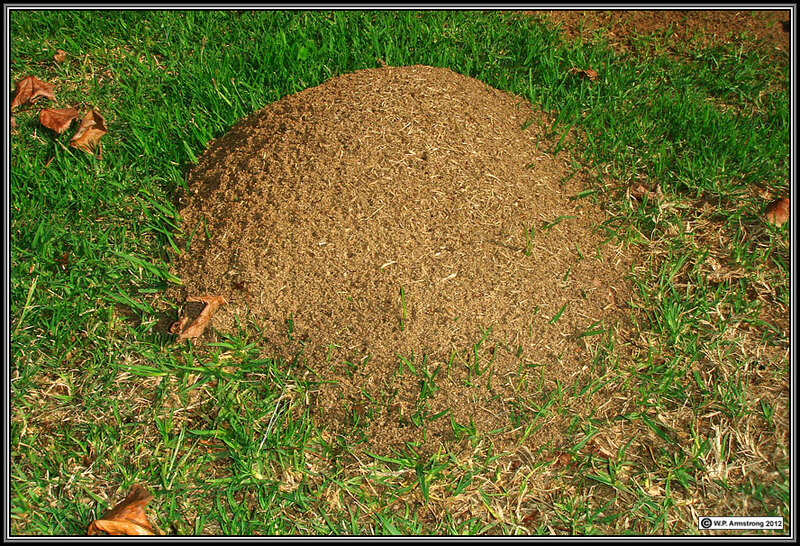 The slightest disturbance to the mound will bring out a swarm of stinging ants including thousands of angry major and minor workers. 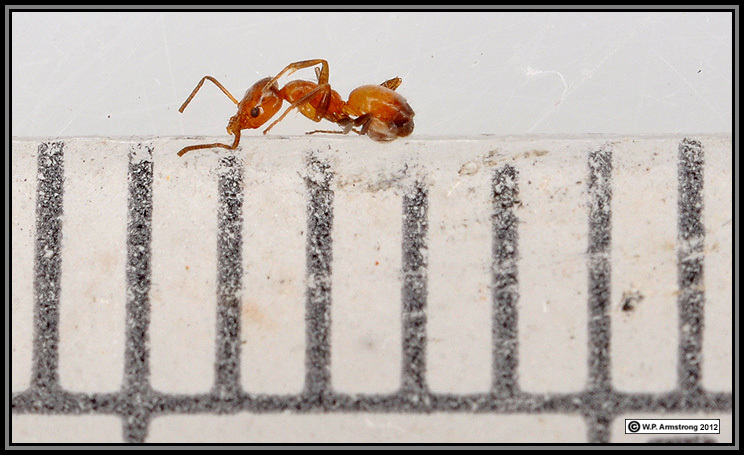 Excavations of the native southern fire ant (S. xyloni) are much smaller. 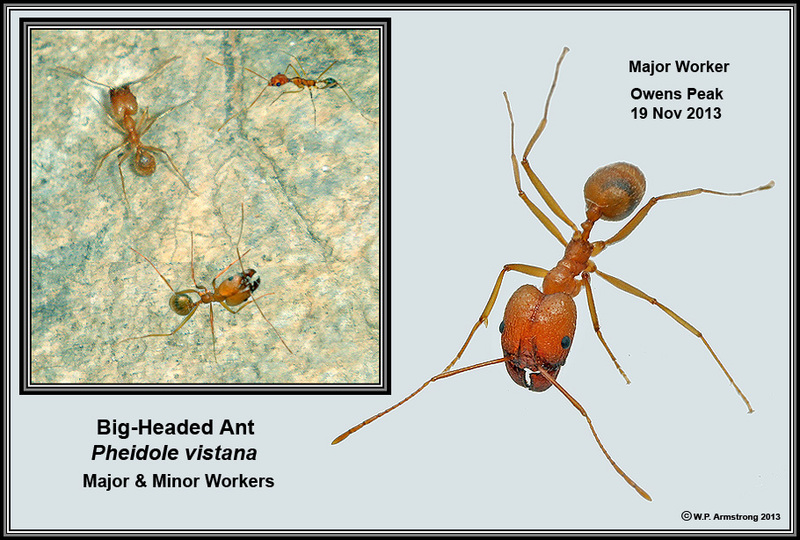 Major and minor workers of the imported South American fire ant (Solenopsis invicta) from Mira Mesa in San Diego County, California. 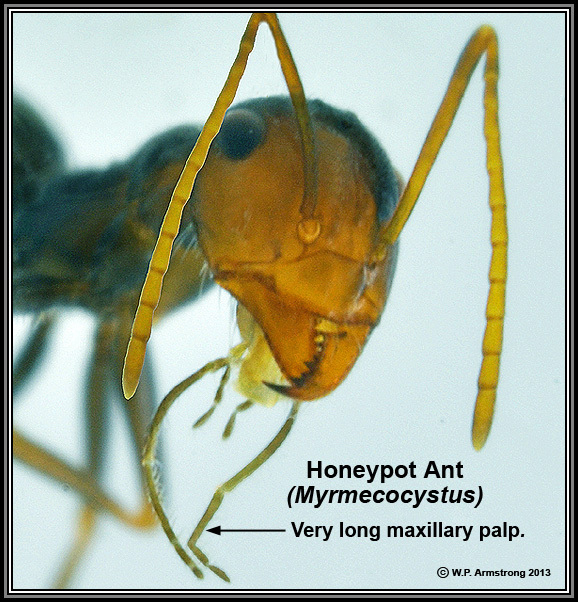 The head and thorax are a little darker than the native southern fire ant (S. xyloni). There are other technical differences beyond the scope of this website. This shiny, South American fire ant was brought back to the Wayne's Word headquarters on Elaine's recent trip to Florida. Although deceased, it shows the typical stinging position on my arm. 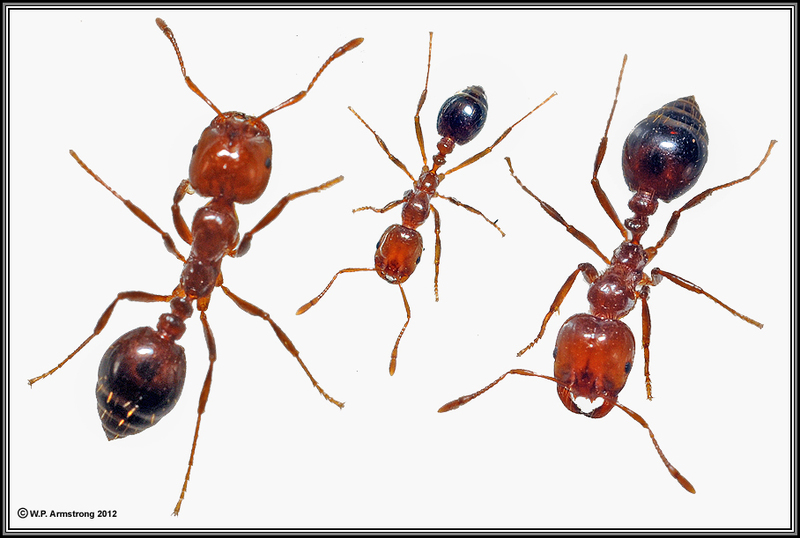 It is much darker than our native fire ants (Solenopsis xyloni). 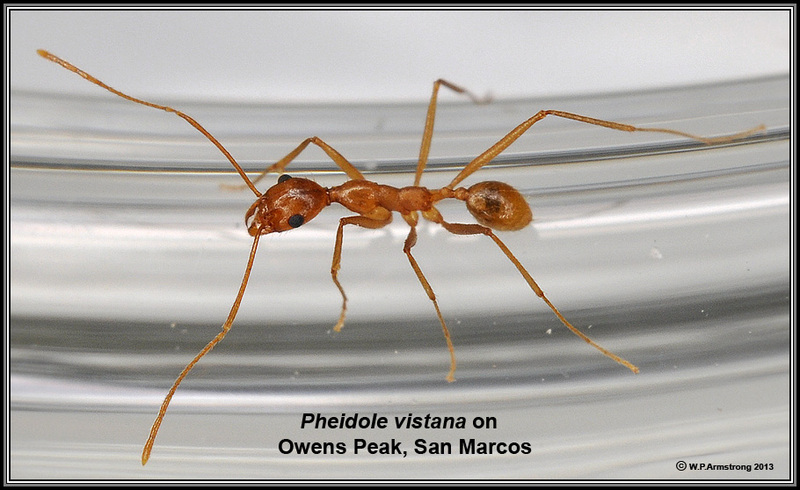 Thief ant (Solenopsis molesta): The appearance of this deceased wingless queen in my kitchen sink coincides with a shopping trip to the local San Marcos Costco. The workers of this native North American ant are very small, only 1-2 mm or less. 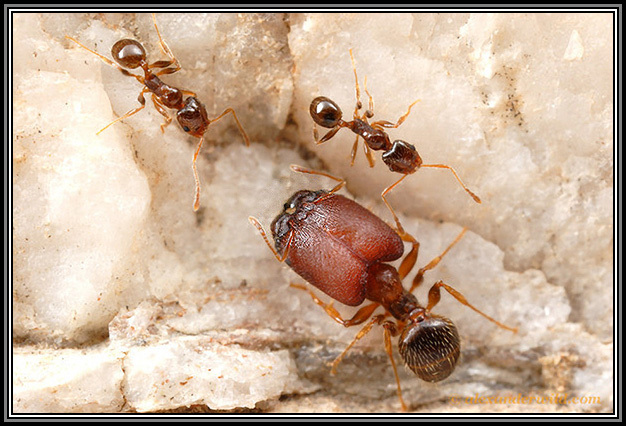 The common name "thief ant" is derived from their habit of taking food from other ant nests. They commonly enter houses and can easily get into food packaging and containers. 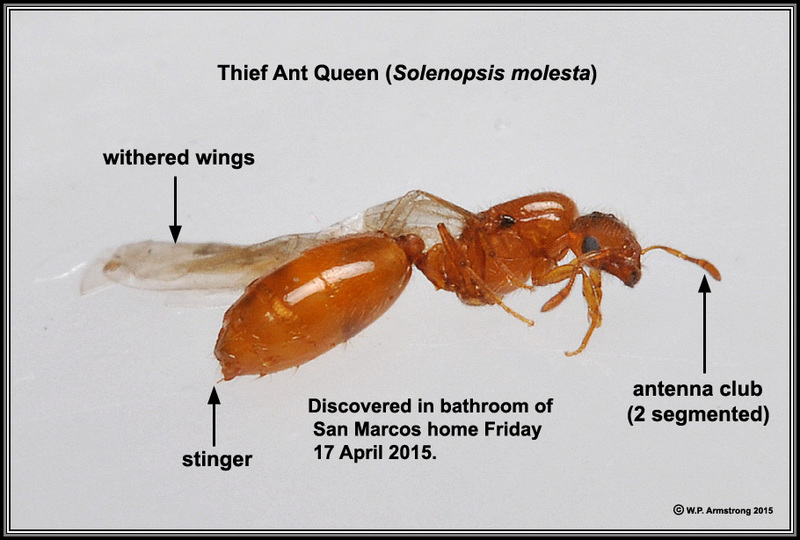 Another queen thief ant (Solenopsis molesta) appeared in my home on 17 April 2015. Due to the high concentration of well-established Argentine ants, it is doubtful that a new colony of this species could become established. These appear to be Forelius pruinosus; however, F. mccooki is very similar. Owens Peak (Palomar "P") north of the Palomar College campus. The summit contains large outcrops of Jurassic age Santiago Peak metavolcanic rock, a black, dense rock containing rectangular plagioclase crystals. 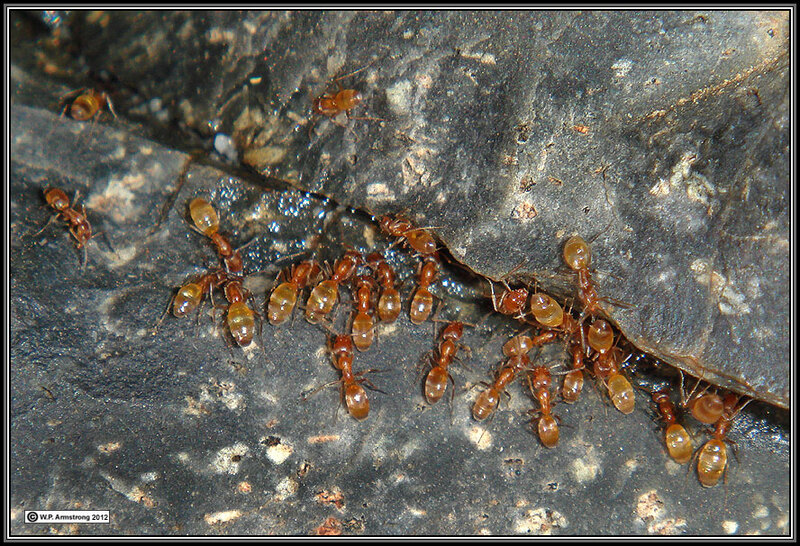 Several species of small ants live in cracks in the boulders, including the orange desert ant (Forelius pruinosus) and southern fire ant (Solenopsis xyloni). Forelius colonies are especially interesting because they are active in daytimes hours during hot summer months even when the dark rocks are heated by the sun to scorching temperatures. 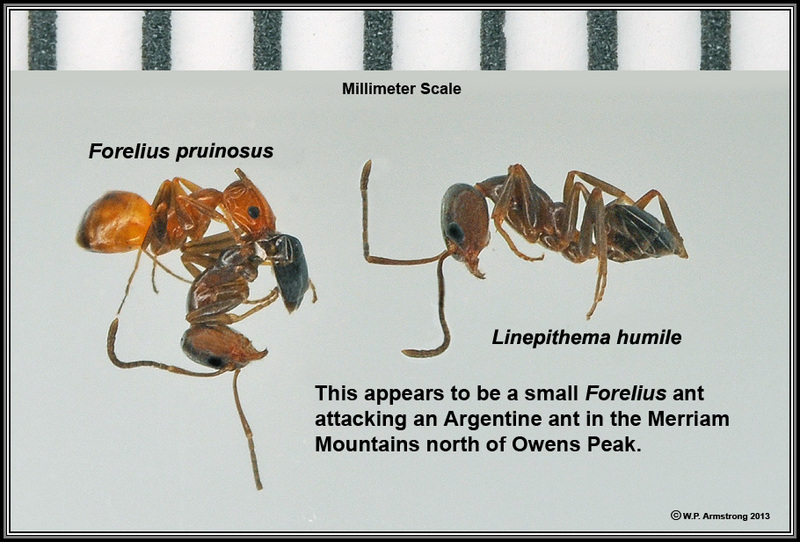 The troublesome Argentine ant (Linepithema humile), a nuisance in nearby housing developments, cannot tolerate these arid sites and has not invaded Owens Peak. In well-watered residential areas it has annihilated the native ant populations. A fast-moving foraging trail of Forelius pruinosus carrying fragments of a crumbled nutrition bar to their nest. 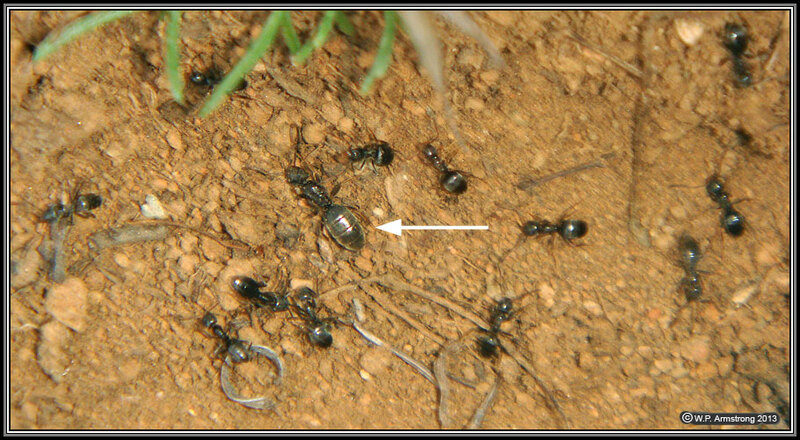 Individual tiny ants only 2 mm long carry remarkably large morsels in relation to their size. They are running across the surface Jurassic age Santiago Peak metavolcanic rock with embedded plagioclase crystals. On this hot summer day the dark rock surface was heated to a temperature of well over 100 degrees Fahrenheit. 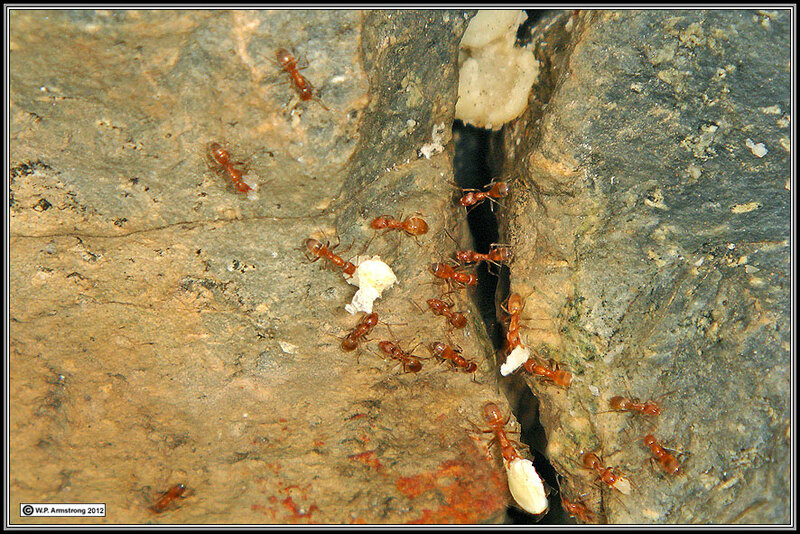 Forelius ants drinking water from a crack in the Santiago Peak metavolcanic rock at the summit of Owens Peak. Their gasters (abdomens) are enlarged from consuming water. Note the white plagioclase crystals embedded in the rock. The tiny worker ant of Forelius pruinosus is only 2.0 mm long (1/12 - 1/13 in.). 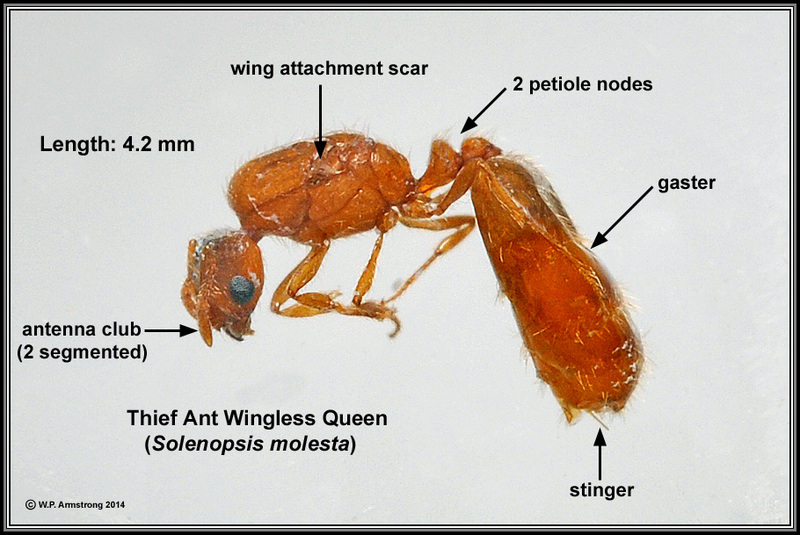 It is smaller than the workers of Argentine ants (Linepithema humile) and southern fire ants (Solenopsis xyloni) which are about 3.0 mm (1/8 in.) long. 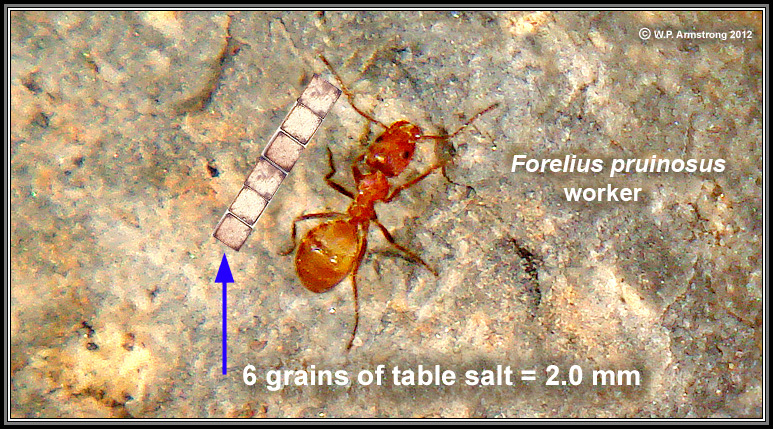 To get an idea of how small the worker of Forelius pruinosus really is I have compared it with grains of ordinary table salt (NaCl). An average cubical grain is about 1.0 mm on a side. For their small size, these minute ants run very fast. Using macro mode on this Sony T-10 you must use high speed flash, otherwise all you would get is an orange blur! Image quality is greatly improved using a Nikon D-90 SLR with high end macro lens and ring flash in the next image. Superior results could undoubtedly be achieved with a full frame Nikon D-800 or Cannon 5G Mark II. Orange desert ant or sidewalk ant (Forelius pruinosus), native to arid regions of the southwestern United States, including southern California and Arizona. 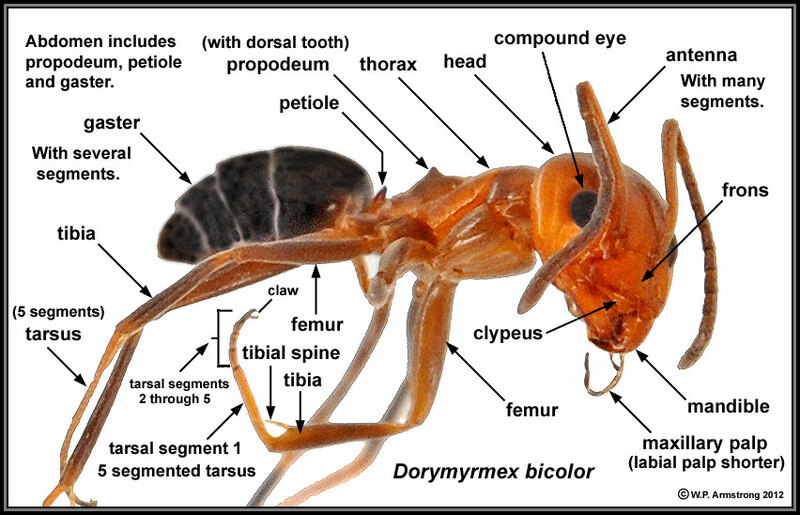 There apparently is no universal common name for this ant so many authors refer to it by its generic name Forelius. The workers are only 2.0 mm long (1/13 in. 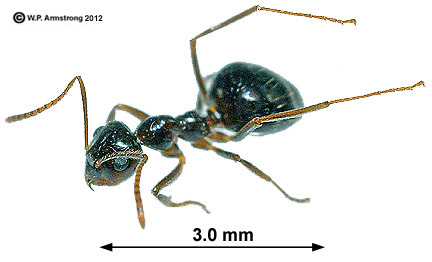 ), smaller than the southern fire ant and Argentine ant. 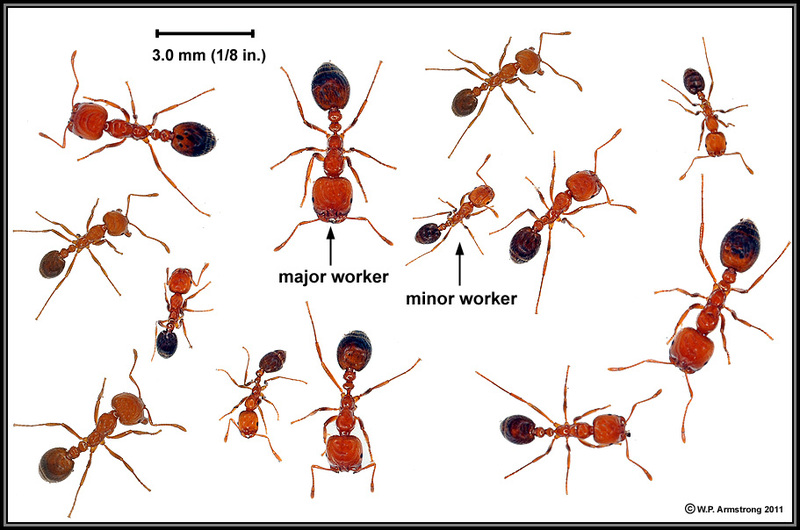 Unlike the polymorphic southern fire ant, the workers of Forelius are the same size. 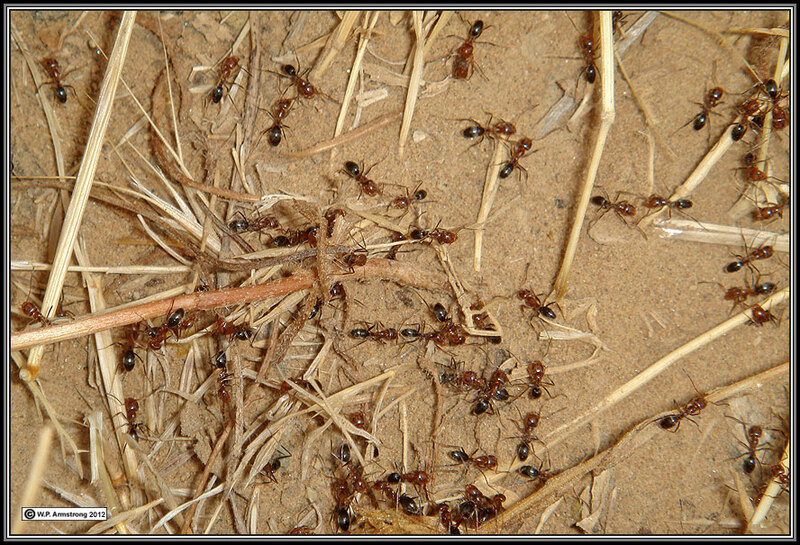 These ants are active in the heat of day, when other ants have retreated into their burrows. For such tiny ants they run very fast at a seemingly frantic pace (see videos below). In fact, you need a macro lens and high speed flash to photograph them. On the summit of Owens Peak north of Palomar College they run across black Santiago Peak metavolcanic rock heated by the sun to high surface temperatures. On very hot summer days you can barely touch the rock surface with your bare hands. These sun-baked outcrops are intolerable to other ants and insects during the daytime. When food is available, such as my nutrition bar, they quickly form foraging trails running to their nests in different directions. 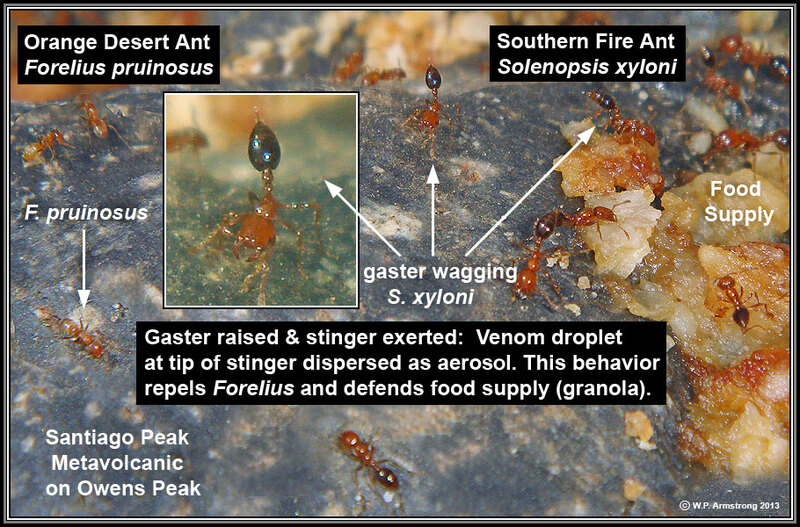 According to David Lubertazzi and Gary Alpert Navajo Nature, the agile, fast-moving workers lay down a trail of methyl-n-amyl ketone substance that is emitted from their gaster (abdomen). Forelius is polygynous, meaning its colonies contain many queens. The colonies appear to lack nestmate recognition so there is no hostility between neighboring colonies (unicoloniality). The multiple foraging trails move away from my nutrition bar to distant nests in the bunch grasses and rock outcrops. 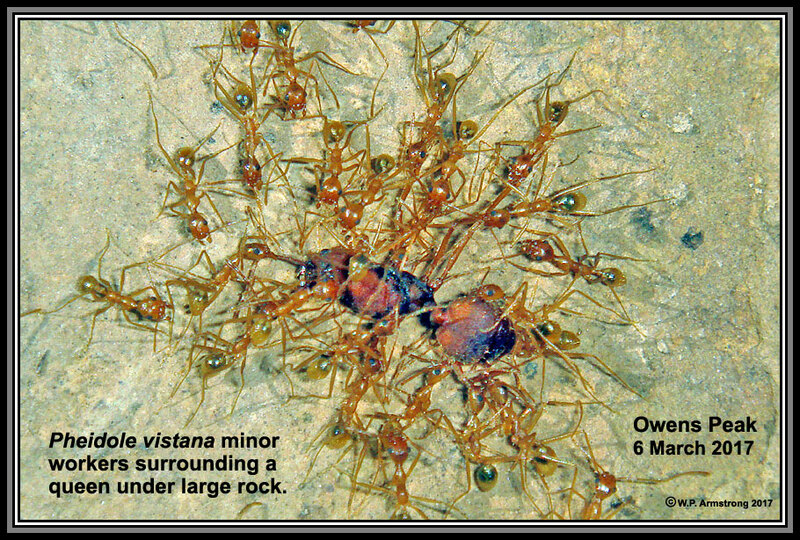 I have watched these ants on outcrops of metavolcanic rock and granodiorite near Palomar College for the past 40 years Only recently (July 2012) did I ever figure out their name! These Ants Really Run Fast For Their Minute Size. Forelius mccooki is very similar to F. pruinosus. The most obvious differences are erect hairs on the head and on the antennal scape. These are easily overlooked. 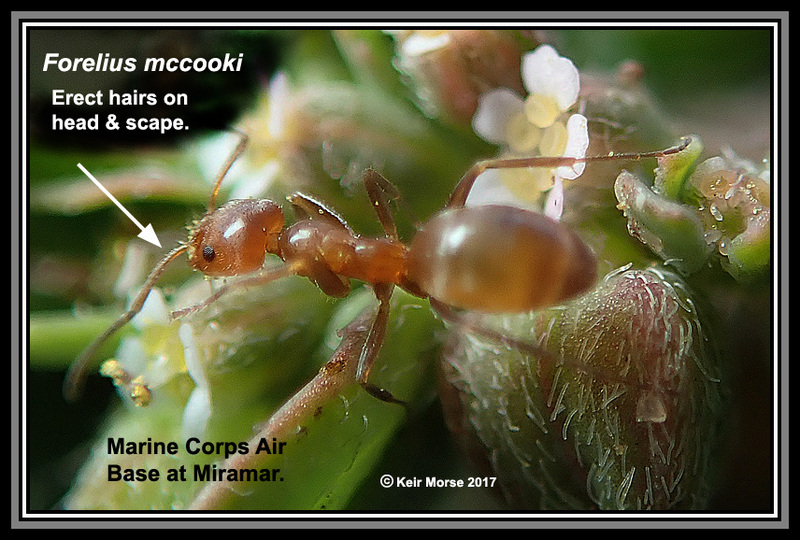 Most of the Forelius populations I have observed in California and Arizona had scapes without hairs; however, Keir Morse photographed a Forelius in a wash at the Marine Corps Air Base at Miramar in San Diego County that appears to be F. mccooki. 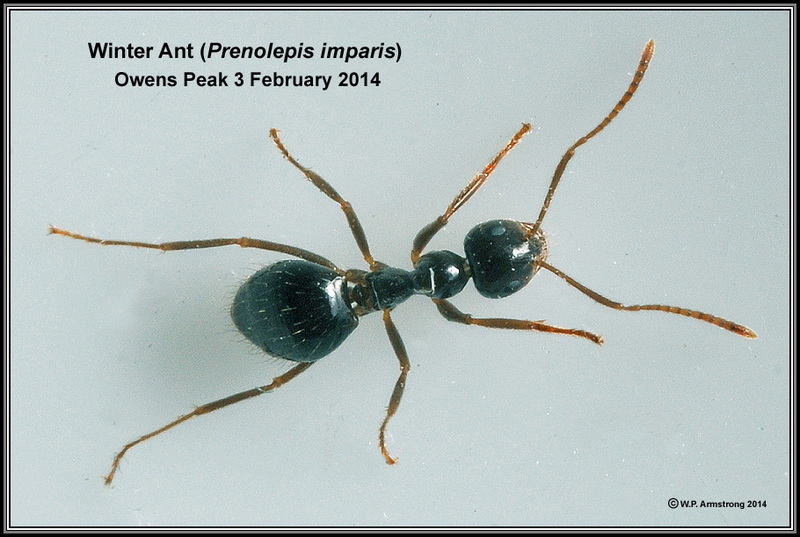 Several ant surveys in this region of San Diego County have also recorded this species. Dorymyrmex bicolor along dirt road north of Owens Peak. Note the prominent conical protuberance on propodeum. The propodeum is the first segment of the abdomen. It is fused with the posterior end of thorax. Dorymyrmex bicolor with death grip on the wing of deceased honey bee. Specimen collected along dirt road north of Owens Peak. The prominent conical protuberance on propodeum and petiole matches the previous photo image of Dorymyrmex bicolor. Dorymyrmex (probably D. bicolor) with winged males emerging from nest. 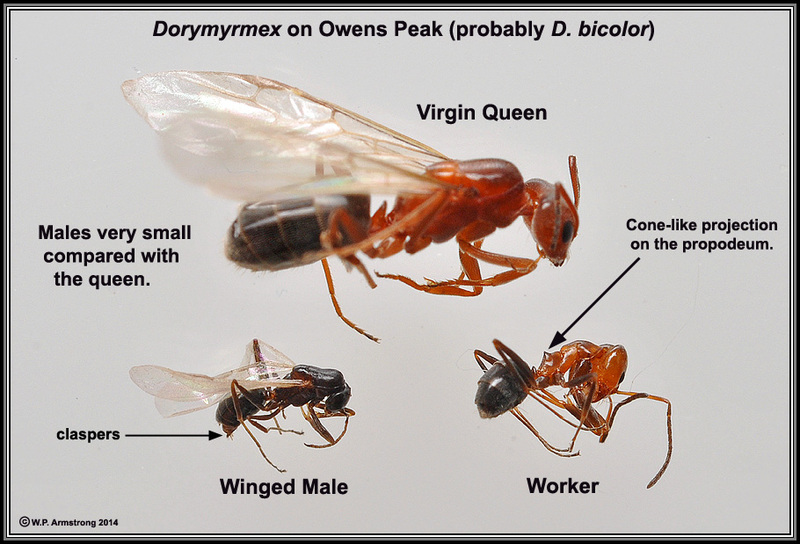 Dorymyrmex (probably D. bicolor) queen, winged male & worker. 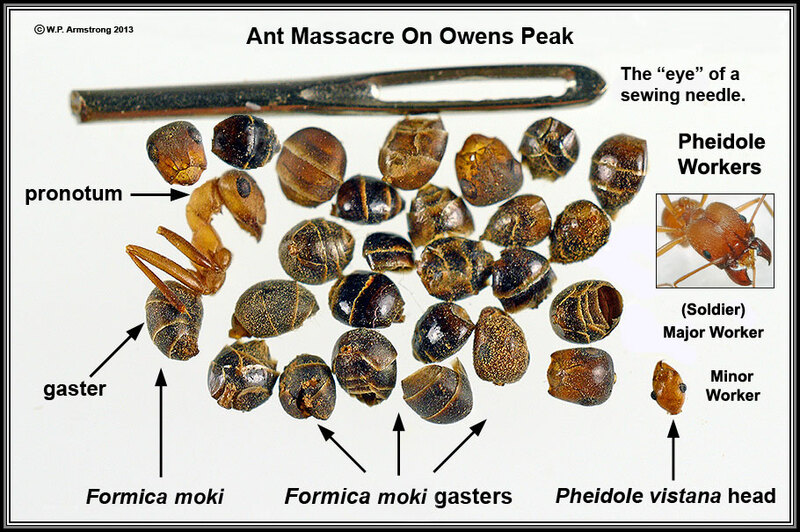 Mystery ant on Owens Peak finally solved. 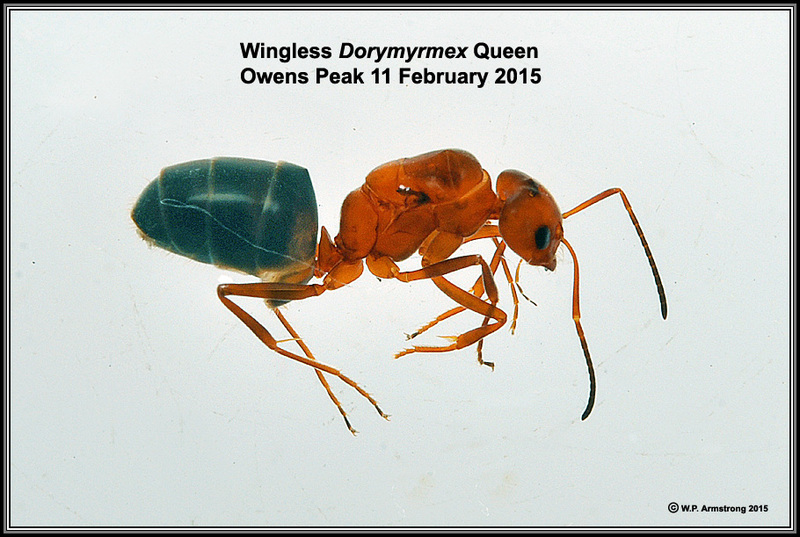 It is a Dorymyrmex queen after shedding her wings (probably D. bicolor). This species was swarming in a nest on the upper slopes on the same day. Nest of small mound-building ants of the genus Dorymyrmex. Dorymyrmex (possibly D. bicolor) on Palomar Mountain. 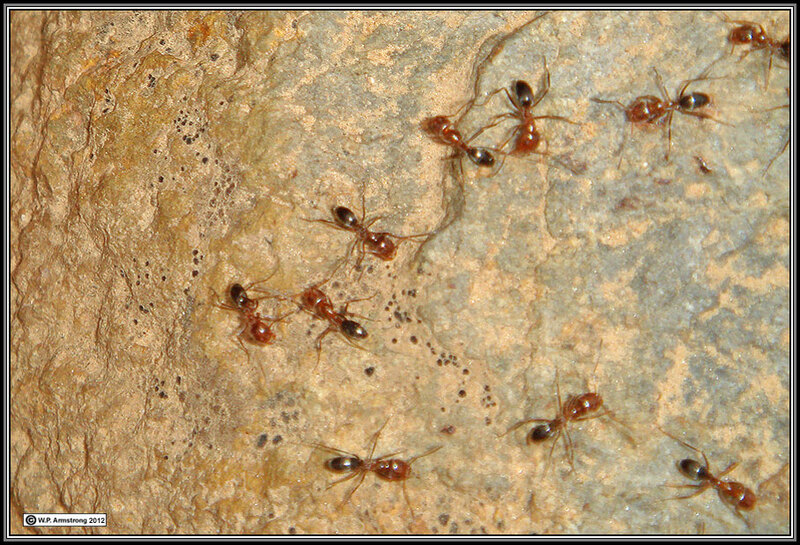 Worker ants of Tapinoma sessile from the Santiago Peak metavolcanic outcrop at the summit of Owens Peak. The workers were all the same size and about 3.0 mm (1/8 in.) long, about the same length as Argentine ants (Linepithema humile). They came to forage in the same area where I photographed orange desert ants (Forelius pruinosus) and southern fire ants (Solenopsis xyloni) the day before. 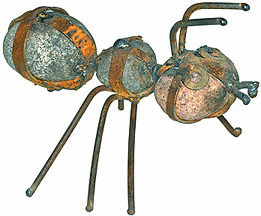 According to Wikipedia, they are very tolerant of other ant species and can live in close proximity to other nests. 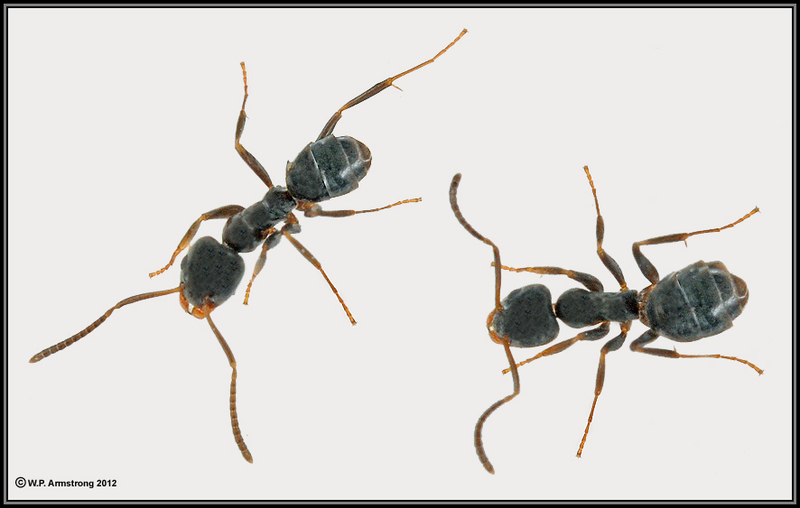 Crushed ants give off an odor, and since this species commonly invades houses, it is called the "odorous house ant." Worker ants of Tapinoma sessile from the north side of Owens Peak. The workers were all the same size and about 3.0 mm (1/8 in.) long, about the same length as Argentine ants (Linepithema humile). The larger ant (white arrow) is a queen. Migrating Tapinoma sessile crossing a dirt road on north side of Owens Peak. I brought some back to my home for observation and they were quickly discovered and attacked by Argentine ants (Linepithema humile). The Argentine ants appeared to be much more aggressive than Tapinoma. 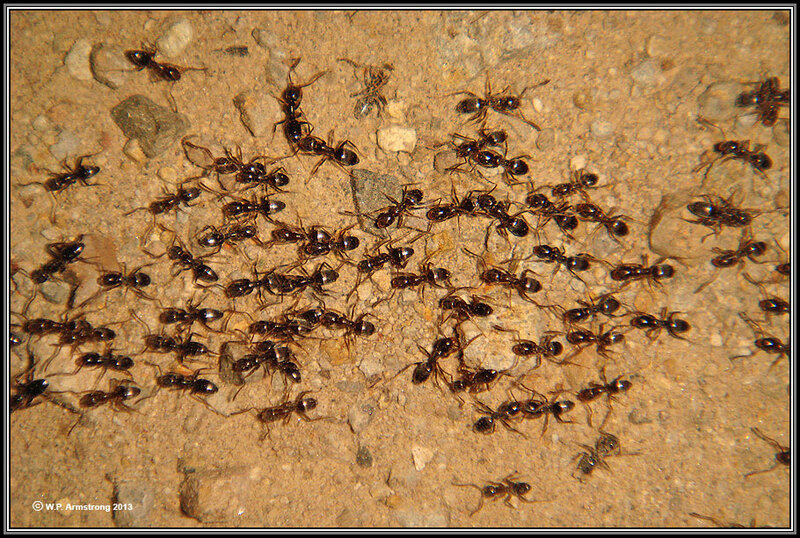 In fact, several Argentine ants attacked a single Tapinoma. Buczkowski, G. and G.W. Bennett. 2008. "Aggressive Interactions Between the Introduced Argentine Ant, Linepithema humile and the Native Odorous House Ant, Tapinoma sessile." Biol Invasions (2008) 10.1007/s10530-007-9179-9. 10.1007/s10530-007-9179-9. 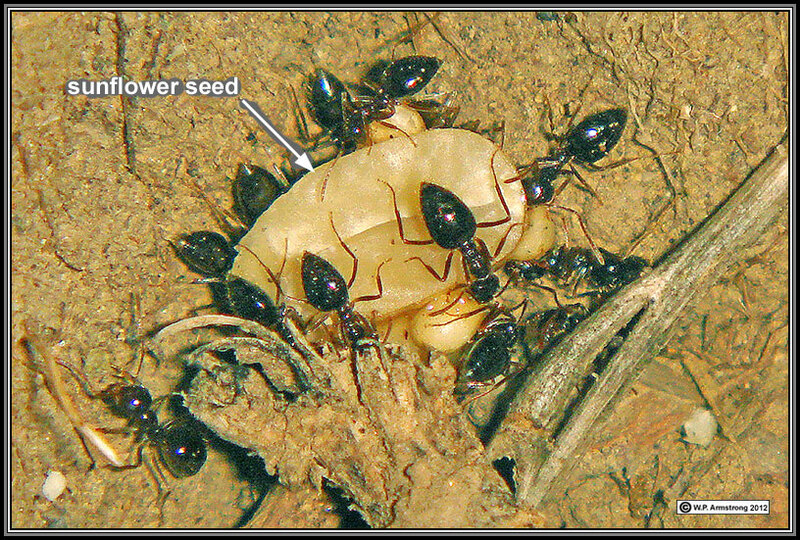 Winter ant workers (Prenolepis imparis) feeding on a sunflower seed along steep trail to Owens Peak. 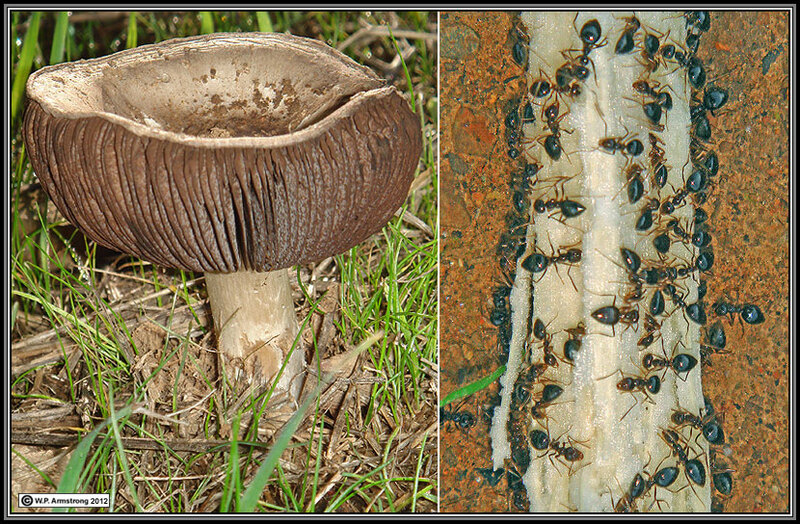 Winter ant workers (Prenolepis imparis) feeding on the stalk of a mushroom (Russula?). 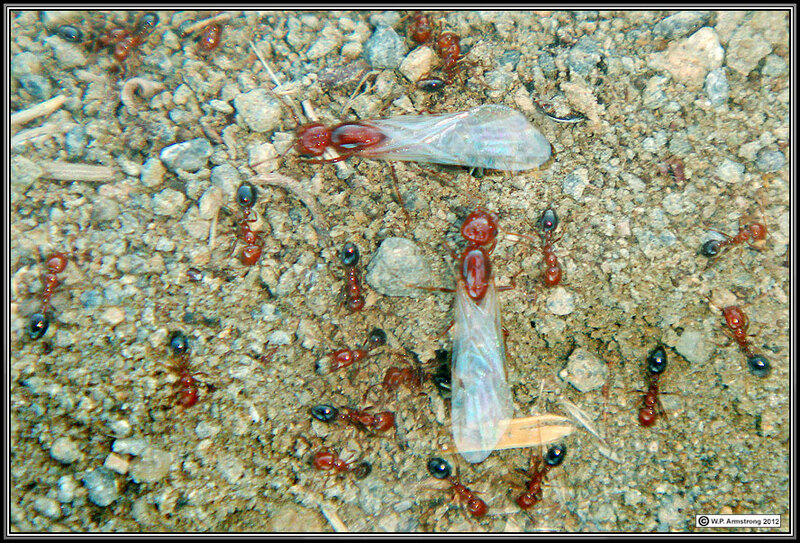 Workers of winter ant (Prenolepis imparis) from the north side of Owens Peak. I first noticed these shiny black ants on 3 December 2012, hence the common name of "winter ant." The thorax (mesosoma or alitrunk) is constricted in center and resembles the shape of an hourglass when viewed from above. These ants are slightly larger than Argentine ants (just over 3.0 mm). According to Trevor R. Sorrells, et al. (2011), they secrete a hydrocarbon mixture that is lethal to Argentine ants, thus providing an effective defense against this invasive species from South America. This shiny black ant on Owens Peak superficially resembles the winter ant (Prenolepis) except its first antennal segment (scape) is shorter than Prenolepis (not longer than the head). In addition, it has a distinctive heart-shaped gaster, pedicel with two nodes, 3-segmented club, and a pair of dorsal spines on the propodeum. The name "acrobat" refers to the flexible way that a worker holds its abdomen (gaster) up over the rest of its body. Vachellia drepanolobium (formerly Acacia drepanolobium). This is the famous "whistling thorn" of Kenya. 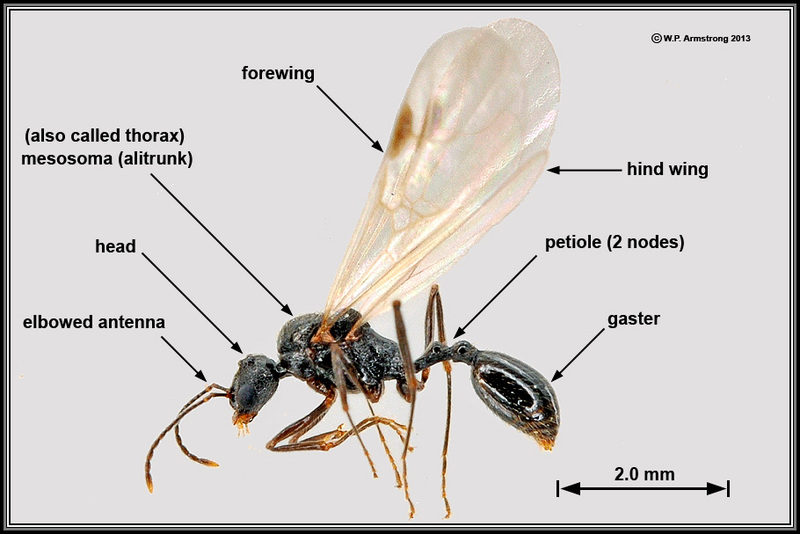 It has bulbous thorns (paired stipular spines) occupied by stinging ants of the genus Crematogaster. 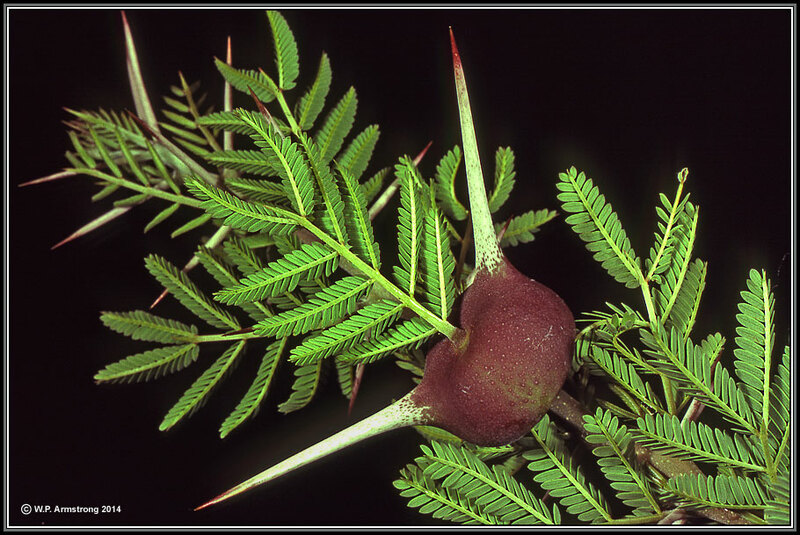 Like the Central American acacias, the ants hollow out the soft green thorns for living quarters. Giraffes and other herbivores normally eat thorny acacia foliage, but leave the whistling thorn alone. In fact, for most South African acacias, spines alone are no deterrent to giraffes. They simply reach high into the branches and carefully wrap their long prehensile tongue around the tender foliage, carefully avoiding the vicious spines. Old thorns which have been vacated by the ants make a whistling sound as wind blows across the entrance hole. See more information below. 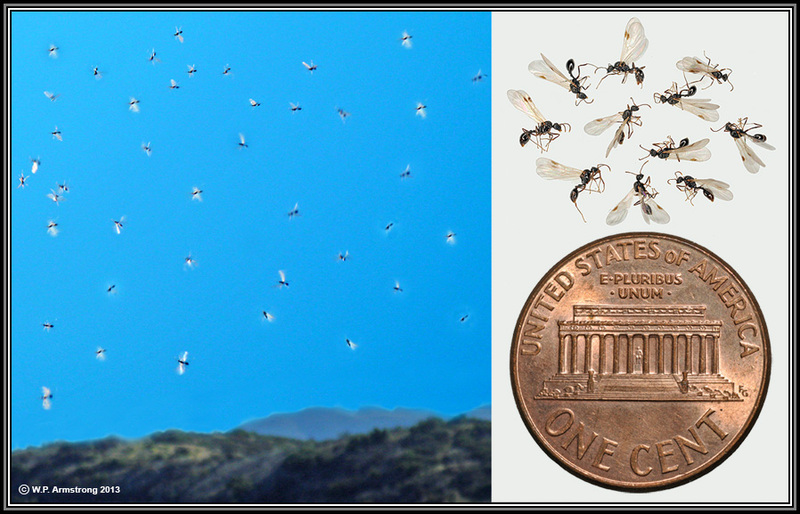 Left: Swarm of flying ants ("nuptial flight") over Owens Peak (18 January 2013). Right: Close-up view compared with U.S. Penny (19 mm in diameter). 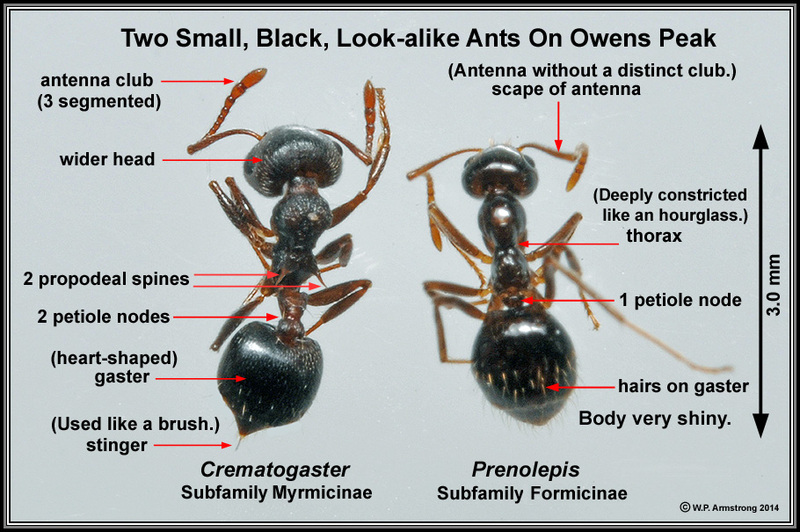 Individual ants are about 4 mm long with a brown spot on forewings. These are males because of the small heads and pair of claspers at posterior end of gaster. 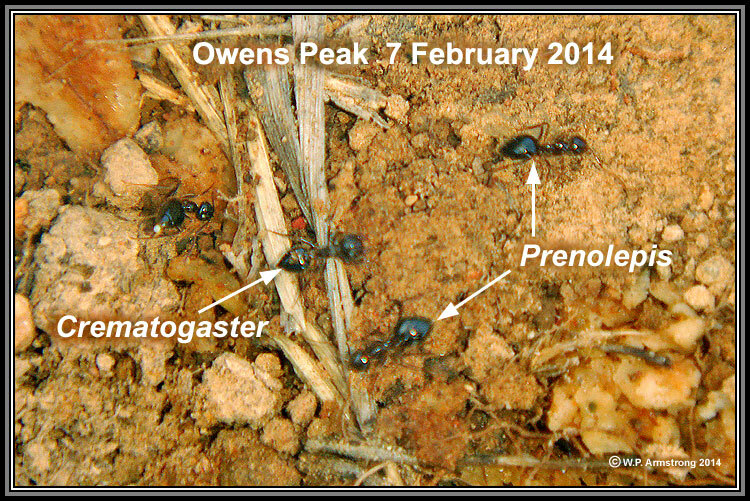 The species is undetermined; however, the most active ants I observed on Owens Peak at this time of the year was the winter ant (Prenolepis imparis). Dorymyrmex bicolor was active later in January, but the males of that species are smaller. 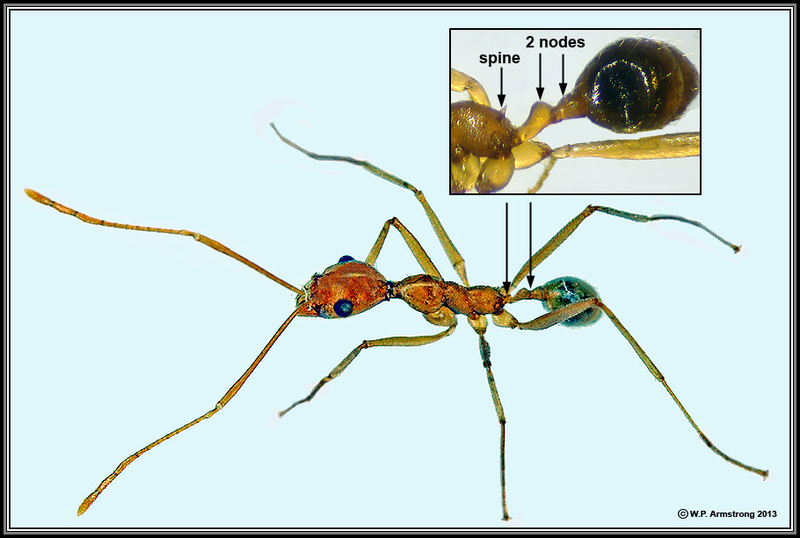 The 2 petiolar nodes resemble workers of the southern fire ant (Solenopsis xyloni), another native species in the area. On January 19, I followed a large swarm of flying ants to its souce in a saddle north of Owens Peak. Winged ants were climbing the blades of grasses and workers of Tapinoma sessile were abundant among the adjacent rocks. This species has a single, flattened petiolar node and the antennal scape is longer than the next 4 segments combined. 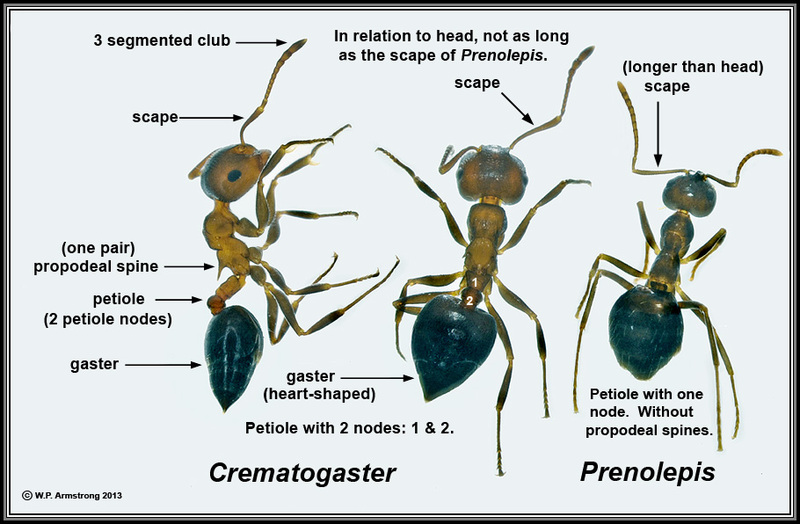 Its thorax does not have the shape of an hourglass as in Prenolepis imparis. It is clearly distinguished from the winter ant. 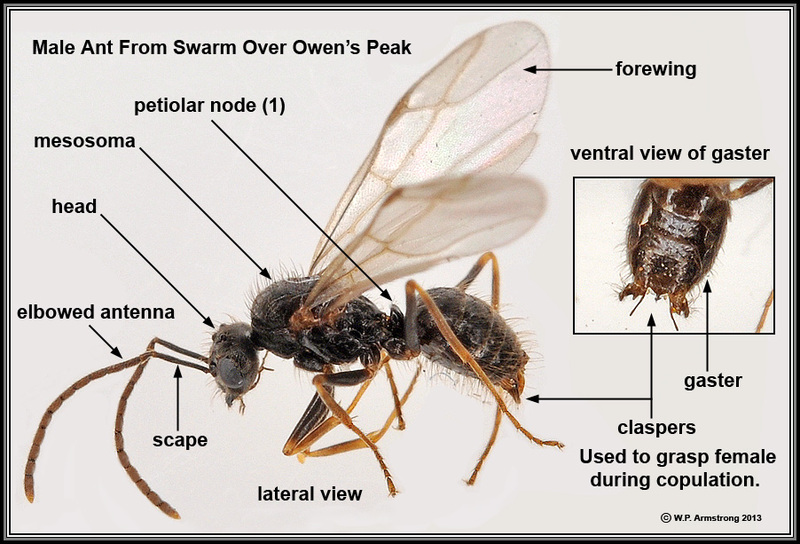 There are undoubtedly more than one species of winged ants in the swarms observed over Owens Peak. 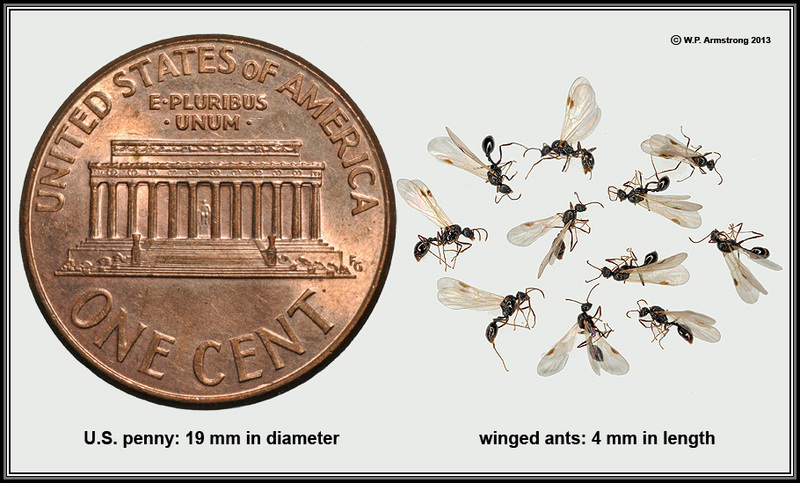 Small winged male ants compared with a U.S. penny. Winged male ant from a swarm that I walked through on Owens Peak (8 January 2013). Another male ant from Owens Peak. The single petiolar node is similar to workers of Prenolepis imparis. Evans, A.V. 2007. Field Guide to Insects and Spiders of North America. Sterling Publishing Co., Inc. New York, NY. Hölldobler, B. and E.O. Wilson. 1990. The Ants. Harvard University Press, Cambridge, Massachusetts.